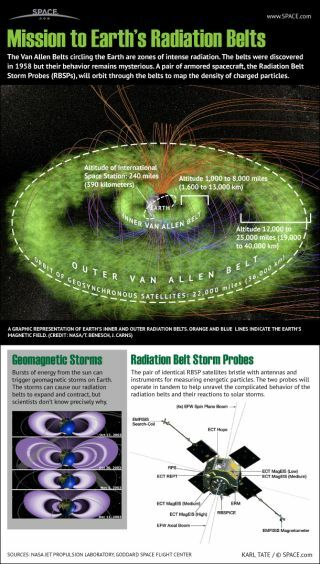 NASA's Radiation Storm Belt Probes mission will study Earth's radiation belts, the Van Allen Belts, like never before. See how they will work in this SPACE.com infographic. The Van Allen Belts circling the Earth are zones of intense radiation. The belts were discovered in 1958 but their behavior remains mysterious. An inner Van Allen belt extends from an altitude of about 1,000 to 8,000 miles (1,600 to 13,000 km), compared to the orbital altitude of the International Space Station (240 miles, or about 390 kilometers). The outer radiation belt extends from 12,000 to 25,000 miles (19,000 to 40,000 km) in height. Geosynchronous communications satellites orbit just inside the outer edge of this radiation belt. Bursts of energy from the sun can trigger geomagnetic storms on Earth. The storms can cause our radiation belts to expand and contract, but scientists don’t know precisely why. A pair of armored spacecraft, the Radiation Belt Storm Probes (RBSPs), will orbit through the belts to map the density of charged particles. The satellites bristle with antennas and instruments for measuring energetic particles. The two probes will operate in tandem to help unravel the complicated behavior of the radiation belts and their reactions to solar storms. They launch in August 2012.